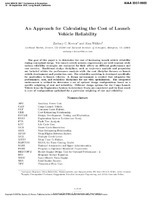 An Approach for Calculating the Cost of Launch Vehicle Reliability - Download this document for free, or read online. Document in PDF available to download. The goal of this paper is to determine the cost of increasing launch vehicle reliabilityduring conceptual design. The launch vehicle mission requirements are held constant whilevarious reliability strategies are evaluated for their affects on different performance andcost metrics. Traditional design disciplines, such as trajectory analysis and propulsionare included within the performance analysis while the cost discipline focuses on launchvehicle development and production cost. The reliability modeling is developed specificallyfor application to launch vehicles. A design environment is created that integrates theperformance, cost, and reliability disciplines for use with optimization. The integratedenvironment is utilized to determine a set of optimal design configurations based on aspecific weighting of cost and reliability. Different design options for the Cargo LaunchVehicle from the Exploration System Architecture Study are considered and the final resultis a set of configurations optimized for a particular weighting of cost and reliability.